Charles Appiah (left) and Manasseh Fumey after their sentence. 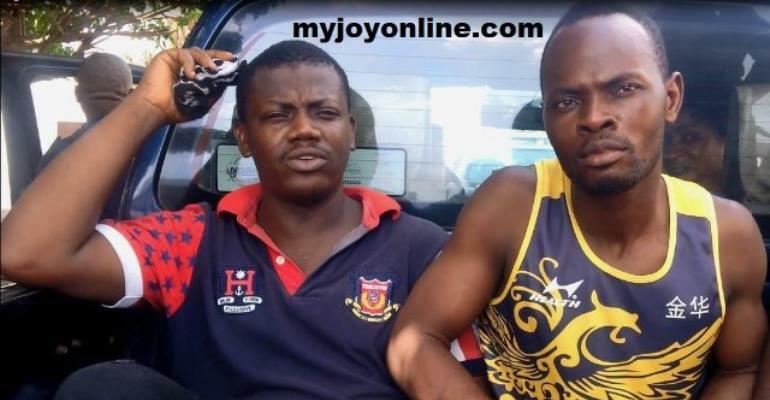 Two friends who conspired and kidnapped a 14-year-old boy at Ejisu in Ashanti Region, have been sentenced to 12 years imprisonment with hard labour by Juaben Circuit Court. Charles Appiah, 38-year-old unemployed and Manasseh Fumey, 29, lured the teenager to KNUST Junction in Kumasi. They bundled him into a waiting Toyota car to Apatrapa, another suburb and demanded $ 3,000 ransom from the boy's relatives. The two had appeared before the Juaben Circuit Court for the first time on Friday after their arrest by the Ejisu Police. They were charged for conspiracy to commit crime and kidnapping. Charles Appiah pleaded guilty to all charges and was sentenced to five years and nine years, respectively, for the two counts conspiracy to commit crime and kidnapping. Manasseh Fumey, a security guard at Living Waters Hospital at Ejisu was, however, slapped with 3-years in imprisonment in hard labour, for failing to report a felony. He had earlier pleaded not guilty with explanation to conspiracy as well as not guilty to kidnapping. The prosecution told the court the two friends who lived in the same vicinity with the family of the victim, planned and kidnapped the boy with the help of two others now at large. The suspects had lured the Junior High School pupil from his Kwamo family house, chloroformed him, and took him to a secluded storey-building at Apatrapa where he was locked up in a room on March 24, 2019. Appiah was said to have paid for the room in the quiet area. Inspector Victoria Mensah told the court when the victim regained consciousness, one of the kidnappers, identified only as Felix who is on the run, asked for the phone number of the victim's grandmother, called and demanded a ransom before his release. However, on March 27, 2019, shouts from the victim who had then managed to cut the rope the suspects used to tie him up, attracted a passer-by who informed police at Tanoso, leading to his rescue. Manasseh Fumey told the court, though he knew the plan of his friends to kidnap the victim a month ahead, he wanted them to execute it before he would inform the police. He had earlier told the court he did not take part in planning and kidnapping of the 14-year-old. According to him, he reported the plot by Charles and his colleagues to police two days after the victim was reported missing. The Judge, Abdul Yusuf Assibey, described his explanation as unreasonable. The judge convicted Manasseh for failing to report a felony to the police and sentenced him to 3-years imprisonment in hard labour. Meanwhile, the court has issued a warrant for the arrest of fugitives Augustine and Felix whilst Manasseh will re-appear before the court on May 6, 2019, to answer charges on kidnapping.